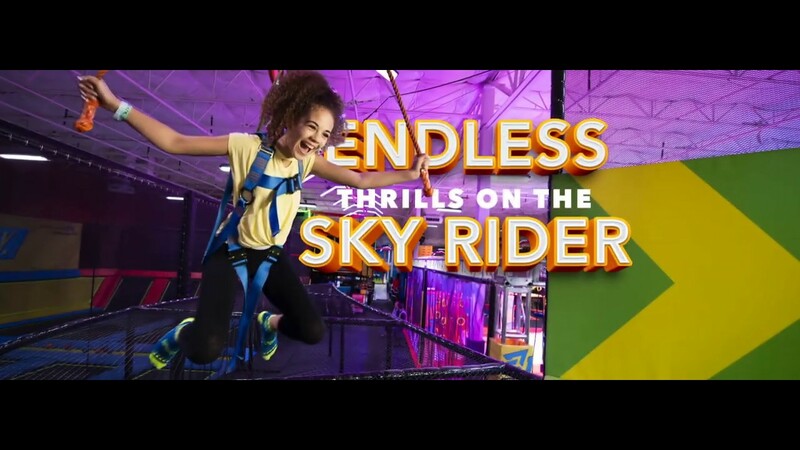 Imagine enjoying endless laps around the go-kart track, endless gravity-defying leaps on trampolines, endless thrills on the sky rider coaster, and so much more! With memberships starting at $6.99 a month, you can come back all year long as many times as you want at a FRACTION OF THE PRICE of a single visit. Because at Urban Air, activating awesome NEVER has to end! *Pricing and attractions vary per park. Click shop now button and choose a location for park specific attractions and pricing. Limited time offer and not all parks are participating. Initial membership period is for 12 months. After the initial 12 month period has concluded, you may cancel at any time. Memberships may only be used for admission at the park you select when purchasing and registering your membership. Unless explicitly indicated, membership benefits and discounts may only be used at the park they are purchased from. Although discount passes, tickets, and add-ons may be available to allow you to visit other properties, admission to other properties is not included as part of your Urban Air membership. Your membership is valid every day that Urban Air is open to the public, but there are a few excluded events. Memberships do not include admission to Birthday Parties, Teen Night, Family Night, Parents Night Out, or Fitness Classes. We reserve the right to close the park for private events, and these dates will be posted on our website in advance. **Park food offerings vary. Add-ons are extra. Substitutes will be provided at park discretion. Refer to your local park for specific offerings. Substitutes will be provided at park discretion. Premium snack provided where Entrée is unavailable. Refer to your local park for specific offerings. 33% off Pizza Special valid where available as vary per park. Not redeemable for 3rd party pizza. Activate Awesome Membership: Ultimate party good for an Ultimate Birthday at a Table for 10 guests. Upgrade options available at additional cost. Full payment due at time of booking. Ultimate Party only valid for membership holder. One party redemption per 12-month period. Membership account holder must have a valid Membership at the time of booking and at the time of the event for this membership benefit to apply. Membership benefits are not transferable. Additional 5 guests: Valid only for a PAID birthday party. Can not be combined with any other offer or promotion. Membership account holder must have a valid Membership at the time of booking and at the time of the event for this membership benefit to apply. Membership benefits are not transferable. How do I book my Activate Awesome Birthday Party? With the Activate Awesome membership, you can book your Ultimate Birthday Party with our party specialists by calling the Birthday Hotline at 800-960-4778. How can I use my 5 free Birthday Party participants? With a membership at the Ultimate, Platinum, or Activate Awesome level you can add 5 birthday participants to your paid birthday party by calling our party specialists on Birthday Hotline at 800-960-4778. Not valid for special events. Not valid for discounted, donated, or Activate Awesome Level free parties. Which parks can I go to with this membership? At this time memberships may only be used for admission at the park you select when purchasing your membership. Memberships must be registered at the park they are purchased from. Unless explicitly indicated, membership benefits and discounts may only be used at the park they are purchased from. Although discount passes, tickets, and add-ons may be available to allow you to visit other properties, admission to other properties is not included as part of your Urban Air membership. Do memberships have blackout dates? No. Your membership is valid every day that Urban Air is open to the public, but there are a few excluded events. Memberships do not include admission to Birthday Parties, Teen Night, Family Night, Parents Night Out, or Fitness Classes. We reserve the right to close the park for private events, and these dates will be posted on our website in advance. Is Jumperoo included in basic for my toddler? At most parks, Jumperoo is included in the deluxe membership and above. You need a parent membership to participate with your toddler. This will also allow your toddler to continue to come to Urban Air in the summer when Jumperoo is not available. How do I know what my membership includes? Does everyone in the family need a Membership? Each individual that wants to participate in any park activities needs to have their own membership. We offer various levels of membership, and a specially priced parent membership so you can enjoy all the fun with your kids. Memberships are non-transferrable, and you cannot share your membership with anyone. Can I buy a Parent Membership? We offer low cost Parent Memberships to allow parents to spend quality time having fun with their kids. We allow the purchase of a maximum of 2 parent passes per account, and they must be used exclusively by the parents or legal guardians when they accompany the minor children to the park. How many people are the memberships good for? Each membership is assigned to an individual during registration and may only be used by that person. Memberships are non-transferrable, and you cannot share your membership with anyone. Your membership never expires. You may cancel at any time after making your 12th payment and at least 15 days before your next payment. Your membership never expires. After the initial 12 month period, your membership automatically renews month to month. You may cancel any time after making your 12th payment, and at least 15 days before your next payment. A membership provides unlimited visits to the park you purchased whenever the park is open to the public. Admission is limited to once per day. Your membership also comes with a variety of benefits described on the membership page at www.urbanairparks.com/membership. Can I use my membership to participate in a birthday party? No. Birthday parties are special private events. Your membership may offer you special discounts and other benefits when scheduling your birthday party at Urban Air. For more information please check at www.urbanairparks.com/membership. You are only charged the processing fee on the initial purchase of memberships, upgrades, or add-on products. There are no processing fees on your monthly payments. The one-time processing fee is $4.99. This fee is the same whether you purchase one or more memberships at any level. Your membership is effective immediately after your purchase and registration. You can even buy a membership on your phone at the entrance to the park and immediately gain admission. All memberships are sold online. You may use any computer, tablet, or phone with a browser. Just click Shop Now above on this page. Login to your account at the Membership Portal and select Update in the Billing Info section. Your credit card will be charged on the same day of the month you initially signed up for your membership. For example, if you purchased on March 12, then all your payments will be charged on the 12th of each month. If you purchase on the March 31, then your payment will be on the last day of the month in months with less than 30 days. In this example, your next payment would be due on April 30th. You can always login to your account at the Membership Portal. Your memberships will show READY FOR PARK if everything is up to date. No. Your credit card will be automatically charged on the same day of the month you initially signed up for your membership. We are unable to accept cash membership payments at this time. Payments must be made online. You can update your billing information or credit card at membership.urbanairparks.com. How do I upgrade my memberships? Go to www.urbanairparks.com/membership and purchase any higher level membership. We will automatically replace your old membership with this new one and restart your membership term for a full year. If I already have a membership, can I upgrade to a better membership? Yes. You can upgrade your membership at any time by visiting the Member Portal. Just login to purchase a higher level membership. Your purchase will be prorated to your next payment date, and your payment date will not change. All memberships are sold online. You may use any computer, tablet, or phone with a browser. Go to www.urbanairparks.com/membership and purchase any higher level membership. We will automatically replace your old membership with this new one and restart your membership term for a full year. Memberships cannot be downgraded at this time. Memberships are non-transferable, and may not be shared with anyone else. No, you may cancel any time after making your 12th payment, and at least 15 days before your next payment. Go to membership.urbanairparks.com and select the cancel link in the Billing section of your membership portal. The link is only available after the initial 12 month period.